Following today's tragic events on the Tube, I was surprised to read that around 25 people die on the London Underground each year, exluding those who die of natural causes. This is considerably more people than cycling kills each year on London's streets. So - should we host die-ins on the Tube? Presumably not. Presumably the best that can be done is to help keep people out of harms way by providing education about the dangers of Tube trains and Tube lines. The same goes for cycling - safety education being paramount - with one difference. To keep people out of harms way on a bike we need to tell them not just how to avoid dangers on the road, such as 'left hooks' from vehicles - especially trucks - turning left; we need to do more. We can help cyclists avoid the busiest roads and junctions altogether. We can provide a useful Tube-style map and system of signage to indicate the thousands of kilometres of quieter cycle routes that already exist in the capital: a London Cycle Map with corresponding signs on the streets. Generally speaking, the cycle campaigners who stage die-ins are the same campaigners who insist on crowbarring cycle routes onto main roads. Both stratagies are unhelpful. Cycling isn't uniquely dangerous. And bikes and main roads don't have to go together. Read more about Die-ins on the Tube? Here's an interesting open letter from Wheels for Wellbeing to TfL. In my opinion, the London Cycle Map is the only proposal that promises to make cycling easily accessible to ALL Londoners, regardless of age, gender or disability. This weekend (8-9 November), Ben Irvine will be giving a couple of talks in Cambridge on two of his favourite topics. The first talk, from 2pm to 3.30pm on November 8, is called ‘Cambridge and the Philosophy of the Commons: A Walking History of the Ivory Tower’. Tickets are priced at £5. Further details and tickets available here. The second talk, from 2pm to 4pm on November 9, is called ‘Cambridge and the Art of Mindful Cycling: Philosophy on Two Wheels’ and requires participants to bring their own bicycle. Tickets are priced at £5. Further details and tickets available here. The BBC is really sitting up and taking notice. Ben Irvine was back on BBC Radio London on 25 Aug at 7.30am discussing the London Cycle Map. Listen up and spread the word. If you thought emotionlessness means rationality, and irrationality means emotionality, then think again. I received an email today from the Greater London Authority’s ‘Public Liaison Unit’, replying (better late than never) to an email I sent earlier this year. 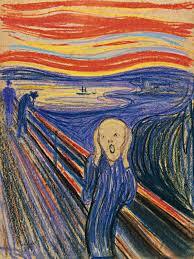 My email made a number of suggestions in regard to the ‘Central London Grid’ proposed by TfL. The key point I made is that the best way to organise and map a network of cycle routes in London – or any metropolis – is to use the Compass Colour System devised by Simon Parker. The email I received not only managed to miss the point entirely, it also managed to show no human acknowledgement of the fact that I enthusiastically volunteered my time to get involved in creating the proposed Grid. Welcome to the world of modern centralised planning, where ineptitude and indifference are practised in the name of the common good, spurred on and inspired by the legions of armchair humanitarians who are currently operating from the nation’s living rooms and council offices. The email I received contained a reminder ‘of the TfL cycling maps that are available off [sic] the TfL website’ - advice which was not very helpful, since these are part of the problem, not the solution. It also contained assurances that my call for a ‘cycling equivalent of the LU map’ is being met ‘through the Central London Grid, which will be a mixture of Quietways and Superhighways in the City, West End and surrounding boroughs’. Well, no, that misses the point too, since most of the proposed network already exists, and the whole point of the London Cycle Map Campaign is to map and sign the existing network properly. Indeed, when I visited the link provided by the email, I saw a 'proposed routes' map of the Central London Grid that looks nothing like a Tube map, and I found a promise that two (wow, two!) Quietways will be completed by 2015: to repeat, both the map of proposed routes and the new routes are irrelevant to the idea of creating a Tube-style map and signage for a cycle network that (mostly) already exists. As for the email’s incantation that ‘Superhighways are mostly segregated and on main roads’ – well, this is just absolute, unmitigated rubbish. The Cycle Superhighways should, in my opinion, go down as one of the great political scandals of our time – hundreds of millions of pounds spent doing little more than daubing blue paint on some of the most dangerous main roads in the capital, in the name of cycling safety. Indeed, even if the Cycle Superhighways were all fully 'segregated', they'd still be a waste of money: if lots of people used those routes, they wouldn't be fast anymore, and there are more sensible ways and places to invest money in cycling than trying to seize back the busy main roads that were made busy precisely through the backstreet traffic-calming measures previously (and sensibly) implemented in the name of cycling. Finally, and most worryingly, the aforementioned website declares that Quietways will be ‘a network of radial and orbital routes throughout London’ (my italics). So there will be no Compass Colour System. There will be no guarantee that a cyclist can travel from A to B, from anywhere to anywhere in London, by following no more than a few coloured routes, on safer, quieter streets. There will, most likely, be a few concentric circular routes created on quiet streets – probably cobbled together out of routes that already exist – marked with some confusing new signage, as well as a confusing new system of signage for the almighty tangle of (mostly existing) routes proposed for (and for leading into) Central London. I can predict this confusion with confidence, because there is simply no sensible way to sign so many routes without using the Compass Colour System. I can also predict that this ‘new’ Grid (which be will be rolled out ridiculously slowly, over ten years) will repeatedly be announced with great fanfare, proclaiming the ‘cycling revolution’ that is currently seeing cycling numbers in London stagnate, with all likelihood that the stagnation will continue. Rest assured though: 'TfL will continue to develop route proposals with our delivery partners'. This is what counts as public services these days. The simplest way to explain the behaviour of any bureaucratic organization, as the poet and historian Robert Conquest pointed out, is to assume that it is controlled by a cabal of its own enemies. Cyclingballs #3: The London Cycling Campaign of Fear? Every cloud has a silver lining: the current Tube strikes, although irritating, are at least inspiring many more Londoners to cycle to work. This surprised me. I thought that one of the major objectives of the London Cycling Campaign is to inspire more people to discover the many benefits of cycling – health, happiness, fitness, free travel, and so on. But the headline suggests that cycling is not a ‘genuine choice’ for Londoners. So what’s stopping them? The press release begins by ‘calling on local councils to redesign our streets so all Londoners have a genuine choice to cycle on Tube strike days’. The theme continues: we need to ‘redesign our streets so they're safe and inviting for everyone to cycle’. So the implication is that until the streets are redesigned people do not have a ‘genuine choice’ to cycle: as things stand the streets are not ‘safe and inviting’. The LCC blunders home the point by quoting from ‘Human Resources Manager Lisa Wyett, 31, who lives in Kingsbury NW London’, and says, "I would cycle to work during the Tube strike if I could, but I’m scared of cycling on busy roads. I'd definitely consider it if the streets were safer for cycling". What a thoroughly depressing and misleading press release! It certainly makes you wonder: are the streets safe for cycling? Well, it depends on the streets, and on how safe you want to be. The LCC’s Space for Cycling Campaign is calling for the capital’s major motor arteries to be ripped up and redesigned with special ‘segregated’ lanes for cyclists. At the moment, those main roads, where buses and trucks hurtle past in high numbers, are naturally pretty inhospitable places for cyclists. The statistics suggest that it is a bit of an exaggeration to call those roads ‘unsafe’ for cyclists (by that logic, they’re unsafe for pedestrians, motorcyclists and drivers too), but certainly it is safer and more pleasant to cycle somewhere other than on the main roads. But there’s the rub. Even if, when it comes to cycling on main roads, would-be cyclists are put off by safety issues and fears about safety (and even if you unhelpfully blur that distinction as the LCC does), Londoners still have a ‘genuine choice’ to cycle: they can cycle on alternative streets. It doesn’t take very long to plan a quieter bike route, taking in London’s lovely backstreets, parks and canals. By obsessing about main roads, the LCC achieves only two things, the second often (but remarkably not always) following from the first: insinuating that there is no choice for new cyclists but to take the main roads, and scaring off new cyclists. Both outcomes are unhelpful – to put it mildly – to the cycling cause in the capital (as well as beyond). There will never be a network of segregated cycle routes on London’s main roads: and there doesn’t need to be. As well as countless unprovisioned quiet roads which are perfectly suitable for cycling on, the capital already has a designated network of thousands of kilometers of reasonably well-developed cycle routes encompassing backstreets, parks and canals. The most effective thing the authorities could do is sign and map this network properly with long, straight coloured routes, so that people can plan and follow a cycle route with the same ease as catching the Tube. People already have a ‘genuine choice’ to cycle in London, but a Tube-style London Cycle Map and network would make cycling a simpler choice. Will this proposal make the headlines? Unlikely. Most people are terrified of cycling, and therefore not interested in sensible commentary. That's why the LCC achieves mainstream publicity through pandering to the climate of fear that is reflected, and stoked, by the media. And that’s why the LCC’s blurs the distinction between safety and the perception of safety: to recognize that there is a difference would be to challenge the media’s fearmongering agenda, and risk being ignored. Of course, new dedicated cycling routes are always welcome. But fearmongering will get cyclists nowhere. Read more about Cyclingballs #3: The London Cycling Campaign of Fear? Cycling to work - looking for inspiration and information? Cycling to work is one of the best decisions you can make. Once you get out there on two wheels you’ll find that all the benefits of cycling will come your way – fresh air, fitness, happiness, freedom, reliability, money saved, and even sunshine. Sadly, many people are put off because they think cycling is a ‘hassle’. Doesn’t cycling make you sweaty and tired? What if you get a puncture? How do you plan a route? What are you supposed to wear? Cycling to Work: A Beginners Guide by Rory McMullan answers all these questions and more, in an accessible, friendly and fun style. Published by Green Books and priced at a very reasonable £4.95, the book is great value – an investment worth really making if you’re thinking of starting cycling but worried about the details. You’ll soon be reassured that there’s no hassle involved in cycling – quite the opposite. It is one of the simplest sources of pleasure and convenience you’re ever likely to find. Read more about Cycling to work - looking for inspiration and information? Recently I was delighted to receive an email from graphic designer Jordan Carr showing me a series of posters he has created featuring inspirational quotes from my book Einstein and the Art of Mindful Cycling. Here is one of the posters, below, and below that a close up of the quote. Thanks Jordan! You can see the rest of the posters here and find out more about Jordan's work here. Signed copies of Einstein and the Art of Mindful Cycling are available here. 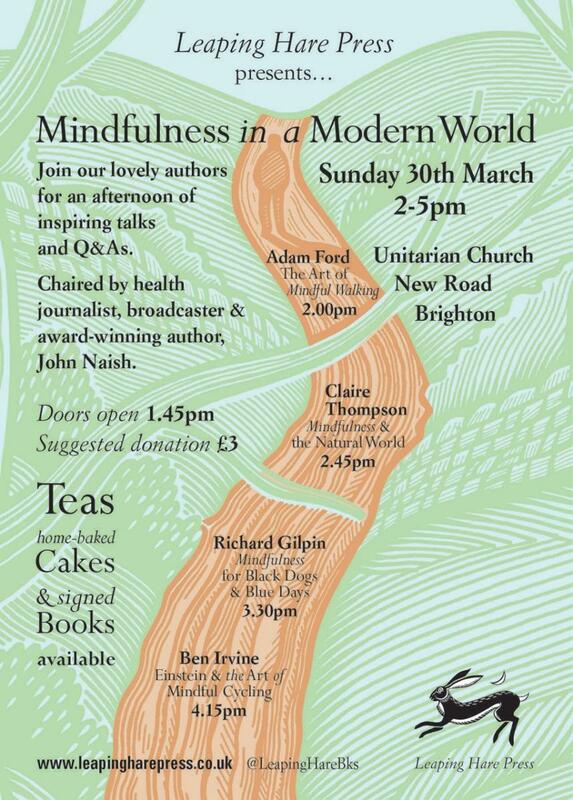 Ben Irvine will be giving a talk in Brighton this Sunday (30 March) on his book Einstein and the Art of Mindful Cycling, as part of the Mindfulness in a Modern World event being run by Leaping Hare Press. See image below for full details.